Isn’t That Why You Got A Swimming Pool In The First Place? Fun in the sun. Bonding with your kids. Socializing with your friends from work. No matter how you use your pool, of one thing we can be certain. You want to have fun, after all, that’s probably the reason you bought a new swimming pool. Swimming pools cause fun, and bring with them a whole list of fun things to do. Be it swimming laps, practicing your dives, or just sitting around in it and feeling the relief of the cool water on a hot day, what you can do with a swimming pool is virtually limitless. You just need the right swimming pool toys to find new ways to enjoy your pool, and spend time together as a family longer. The list of swimming pool toys you can buy is extensive, but here is out list of the 00 essential toys every backyard swimming pool must have. The reigning king of pool toys is still the inflatable beach ball. You can have as many or as few as you like, and create all kinds of pool toys around them or just spend time lobbing them up in the air. Kids and adults love them the same and not only are they still the most popular swimming pool toy you could own, it’s also the cheapest! Water guns are also swimming pool toys that are enjoyed by both adults and children alike. Fill them up with water (from the hose or tap, not the pool) and start squirting away! Play water tag or just play target practice with empty cans lying around. Fill up some balloons with water and you’ll have two different ways of tagging your enemy! If you have young children that are just learning how to swim, a Toypedo can be a great thing. These swimming pool toys look very similar to torpedoes, although you can get them in many fun colors and patterns. As they glide up to 40 feet underwater, children are challenged to try and catch it. It turns your swimming pool into a fun area and a lesson area all at the same time and can be a great tool to use, especially for kids that are afraid of the water. 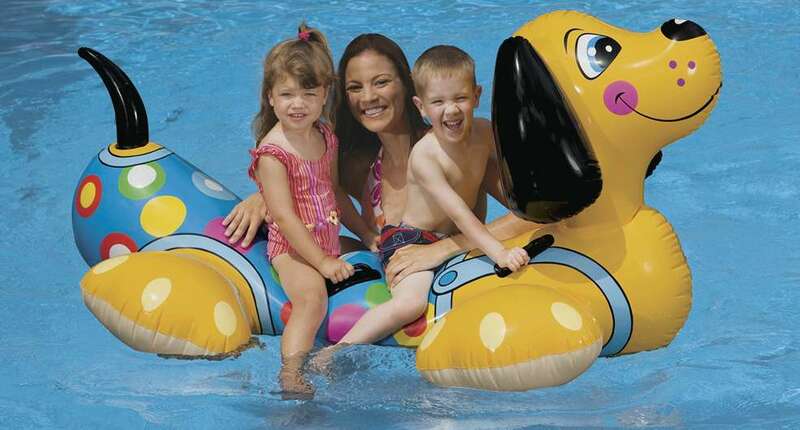 For kid fun specifically, noodles and kick boards remain among the most popular pool toys. Both of these allow kids to float and kick around the pool at their leisure and because they keep you afloat, are also great toys to use for kids that are just learning how to swim. Adults can have their fun with flotation devices too, but these come in the most sophisticated form of floatable lounge chairs. These can be made of foam or inflatable plastic, but those that aren’t as durable or strong also won’t be able to hold an adult for that long; so be careful when you’re picking yours out. When it comes to swimming pool toys, you really have many different options and they’re all there for the picking! Start with a few essentials, see what your family seems to enjoy the most, and then just see how easy it is to keep everyone home for family night!